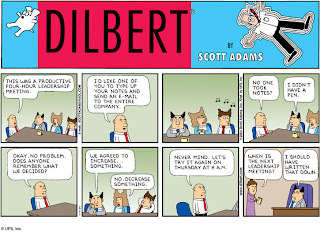 I have a meeting with my direct reports once a week (managers and architects). Its a tradition I've been following for a number of years. Only recently have I had to think about its usefulness or possibly lack there of, given some interesting questions on its value raised by my business partner. Since most businesses, specially mid to large size firms in the US, are guilty of having too many meetings, its a very important question one needs to ask and continue asking over time. Most firms did not start out with having half the working day wasted on meetings, they became that way because bit by bit the working sanity was lost and the environment evolved that way. A ticker in a meeting room showing the cost to the firm of having the individuals in one room and not doing "work". All attendants enter their calculated hourly salary as they enter the meeting and as soon as the figure hits a large threshold, the meeting needs to be disbanded. People to remain standing ie the stand-up meeting. The reason being that people will get tiered quickly and would not want to extend the meeting any more than its actual usefulness. 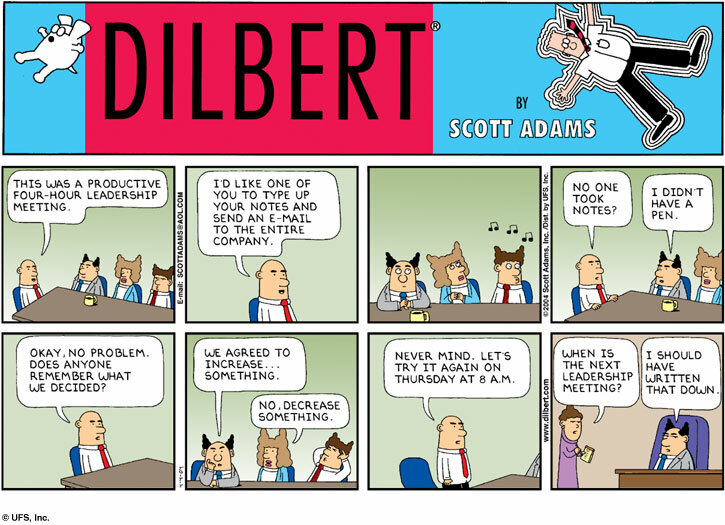 Having a few days in the week as "no-meeting" days. Getting employees to work from home on some days, goes to the previous point. Enables an agile organization capable of quick turnarounds to larger threats. Its important for individuals who are in mid management to have a context as to the challenges being faced across the firm. An agile organization is better driven in an environment where major problems relating to organizational opportunities and threats are known at most organizational levels. It allows for interesting and unique solutions to be thought out even before executives realize its a major problem. Helps job satisfaction. Knowing you're part of the larger decision making, not only in your own team and department, but across the board helps increase employee morale. Ensures a snapshot of the organization progress is known every week, which may be difficult to reach with one-to-one meetings with all reports. Broad meetings typically take precedence over a lot of other work which isnt the case with one-to-one meetings as they may frequently get cancelled or delayed due to impeding priority work. That said, the pinch of salt being to keep such meetings under an hour. In the worst case if they do start getting boring, its not a huge burden. Another is to change the environment of the meetings every now and then, take the team out for a working lunch!